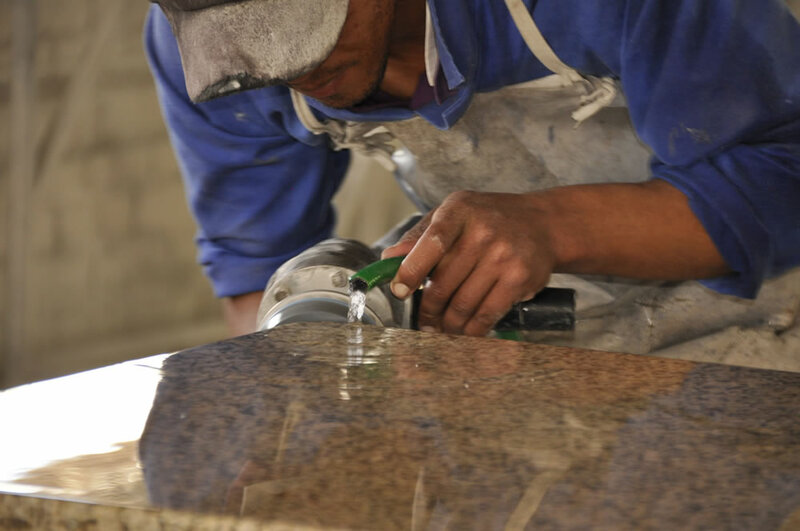 We specialise in supplying and installing a large variety of custom designed granite and marble kitchen tops, vanity tops and various other counter tops. We offer excellent quality, service and reliable delivery. Our factory is situated in Paarl and we service the greater Western Cape, Boland, West Coast areas including Cape Town, Somerset West, Strand, Stellenbosch, Hermanus, Franschhoek and Worcester. Granite, Marble and Engineered Stone are available in a wide range of colours. Samples of different types of material can be viewed below. Granite, marble and engineered stone are available in a wide range of colours so we always advise our clients to visit a number of showrooms to see what material is available and then personally choose the stone they prefer. We have our own showroom in Paarl and also encourage our clients to visit our recommended suppliers’ showrooms. We will also provide you with a personal invitation to ensure that you receive the best service possible. International Slab Sales (ISS) is based in Johannesburg and stocks quartz, granite, marble and engineered stone surfaces for kitchens and bathrooms. They also have a showroom in Cape Town. Stone Connection is an international company with offices in South Africa, Europe, North America and Australia. The company also has a showroom in Cape Town. Stone Connection stocks a range of natural stone and engineered stone. It is always a good idea to visit show rooms to verify that the stone matches your expectations. We have our own showroom in Paarl. We also encourage our clients to visit our selected suppliers’ showrooms. We recommend the following suppliers and will provide you with a personal introduction in order to select your preferred stone from their showrooms. International Slab Sales (ISS) stocks quartz, granite, marble and engineered (sintered) procelain surfaces for kitchens and bathrooms. Their head office is in Johannesburg with showroom in Cape Town.